From parties or sports matches to working in tunnels, Kennards Hire has your lighting requirements covered. Shed a little light on the situation - it's easy to do with lighting equipment from Kennards Hire. Industrial and work applications are not the only lighting needs we attend to - we know you like to kick up your heels after working all day, and we have everything you need to keep the party going well into the small hours. If you're planning an all-night factory fit out, a party, event or wedding, Kennards Hire has everything you need to light the way to a job well. Working in a dark tunnel laying rail is hard work. Some would argue planning a wedding is harder. Either way, at Kennards Hire we believe in making the hard jobs easier. Why deal with a whole lot of different people for different lighting solutions when you can find all you need and more under one roof at your local Kennards Hire? For big events and outdoor displays, flood lights are what you want - and we have plenty of those. Starting at 500 Watt these lights can be combined in many different configurations, depending on your specific lighting needs. 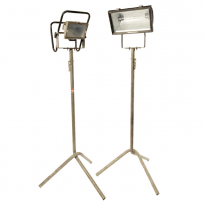 Lightweight portable units or floodlights on stands are available. If you're working in dangerous or confined spaces, we have lights that are suitable for use around explosive gases or in tunnels and sewage pipes. Rail LED lights on portable stands are great for use on rail networks or even for emergency crews lighting up an accident scene or work area. So you want to blind the neighbours? Or your local club wants to play a floodlit game at night? 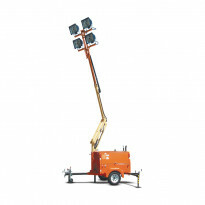 Well, the solution is here - 4,000 Watt lighting towers. 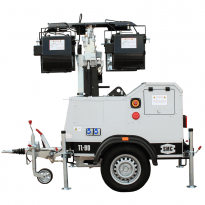 [removed line break] Articulated, towable and silenced, these lighting towers are ideal for the many applications where high-strength broad lighting is needed. Balloon light towers don't reach as high, but are perfect for providing ambient working (or partying) light at the level you need it. With a total of 3,000 Watts per unit, only a few of these will light up any work site sufficiently. Whether you are illuminating an industrial site, road or tunnel works or maintenance operations on a factory, balloon light towers are well-suited to creating the right level of light for maintaining worker awareness and safety. All of the lighting options at Kennards Hire are portable, but some are more so than others. Balloon lighting is not just restricted to towers, and there are actually backpack units available to provide glare-free, optimum workspace lighting that moves with you. Ideal for foremen and site inspectors, these lights illuminate much more than the average torch, and in a much wider arc of vision as well. If you're getting into rough territory with your job, utility LED lights will come to the rescue. With a shock-absorbing rubber base, and UV and salt water resistance. They can be adjusted in height and used on one or both sides. 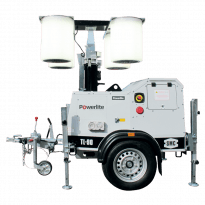 Kennards Hire's balloon and flood light towers are towable and can be moved to and around your work site or event venue with any vehicle that has a towbar. There are many jobs that require lighting - painting offices at night, installing machinery in mines, factory fitouts and roadworks. No matter what the job, Kennards Hire has the lighting solution. For the ultimate in convenience, power and portability when it comes to lighting, talk to a Kennards Hire staff member at your local store to find out how to best fulfil your lighting requirements.